Is the safety of guests your No. 1 Priority ? Let us help you avoid potential slip incidences around your swimming pools, spas, changing rooms, showers, and step areas with our range of specialist safety products. Our New GRP Barefoot Grade Anti-Slip Grating for pool level overflows has proven to be a better alternative for swimming pool overflows. We can also supply pedestrian slip resistant retro-fit overlay products for busy hotel and leisure entrance steps, even kitchen steps and restaurant areas to ensure your members, guest and staff enjoy a much safer environment. Almost every walking surface is different, that’s why we can offer you an extensive range of Anti-Slip Stair & Floor products. Our long term material methods prevent potential slips and falls that can suit both your particular environment and budget. If you remove the slip risk you remove the liability ! Slip hazards are inevitable in the leisure and hotel sector, particularly in the wet areas such as swimming pools, gyms and saunas. That's why we recommend our long-lasting anti-slip barefoot grating, stair covers and resin flooring. The combination of safety floors make your wet and dry areas safe for people of all ages and ability. 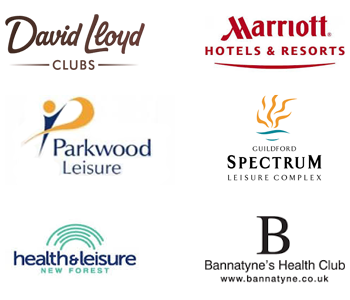 Our team have an in-depth knowledge of the hotel and leisure industry and the experience to achieve the very best end results for every project. Slips, trip and falls are all too common outdoors. These products are designed to prevent such accidents from occurring by fitting easily to multiple different step treads and tread areas. They are tough, and extremely durable, high traction products that will prevent slippage even under the most harsh conditions, the heaviest soiling and highest number in foot traffic. By combining fibreglass rovings with thermosetting resin these gratings are proven to withstand the effects of corrosion and are highly impact resistant. GRP Grating is manufactured as a composite of continuous fiberglass strands and high quality resin and is constructed for strength, while remaining half the weight of steel grating. We are pleased with Gripclad's Mini-mesh grating. It is the perfect solution to replace conventional plastic modular grating that covers the overflow channel around deck level pools.